A Lust For Reading: 1,000 Facebook Likes #Giveaway! 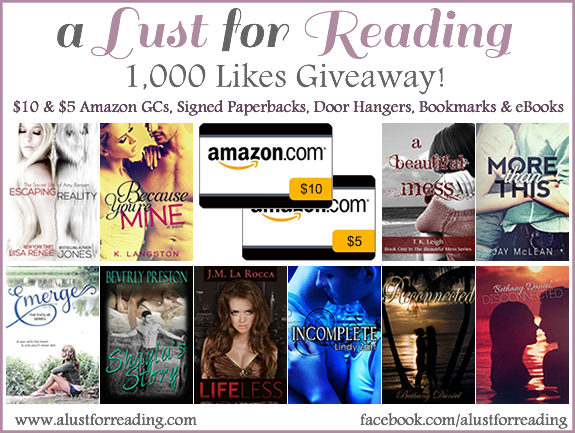 Over the weekend I hit 1,000 likes on my Facebook page and to celebrate I am having a giveaway! I've gotten some great authors and bloggers to donate some awesome prizes. Giveaway will end on October 9 at 12:00 AM EST. Please check the Rafflecopter to see which prizes are open to US only and which are International. Good luck! Thank you for the awesome giveaway !! What they didn't know about your company in the morning, they will find out during the course of the day.